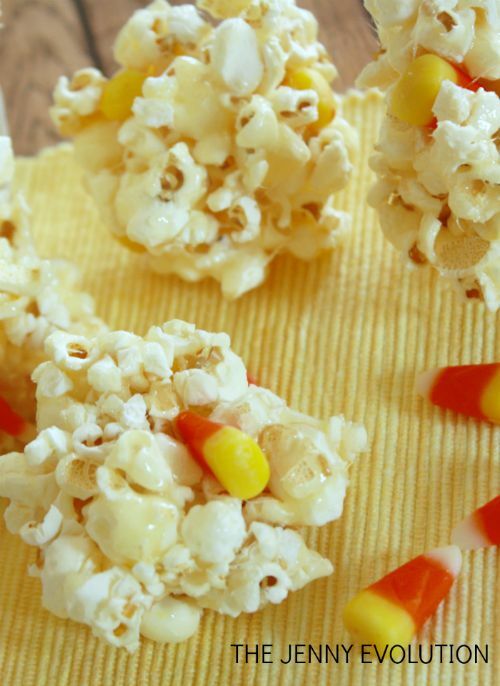 You’re going to devour this easy-to-make recipe for Candy Corn Popcorn Balls. Easy for little hands to grab and will fill up big appetites. Heat first four ingredients in a saucepan to 270 on your candy thermometer. Remove from heat and carefully stir in baking soda. Pour mixture over popped popcorn and toss to coat. 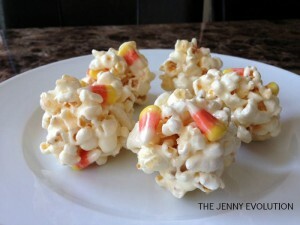 When the popcorn has cooled just a bit (not too long) mix in candy corn and form with buttered hands into 3 inch balls. Set aside on buttered wax paper to cool completely. You could do this with popcorn, as shown above, or make a Rice Krispies treat instead. All you need is some butter, mini marshmallows, vanilla and salt. And of course, some candy corns too. You can even put this together quickly in the microwave. Inspired by a cute recipe from About.com.